If you're not a member of the Downton Abbey cast, chances are you could use a bit of Lady Mary's decorum and charm. Even under what most would consider extreme emotional duress, Mary maintains a politely detached calm and elegance rarely seen in anyone raised in the 21st century. The formidable actress who plays her isn't so different from her character in this way. Michelle Dockery may not be as sartorially adventurous as Rihanna or wear as many bodysuits as Miley Cyrus, but she has the art of grace mastered. Her red carpet choices often highlight her slight physique and enviable posture, and rarely display more than a glimpse of anything risqué. You might even say that Dockery's character on Downton Abbey would deem her choices acceptable--if more modern than she would personally appreciate. 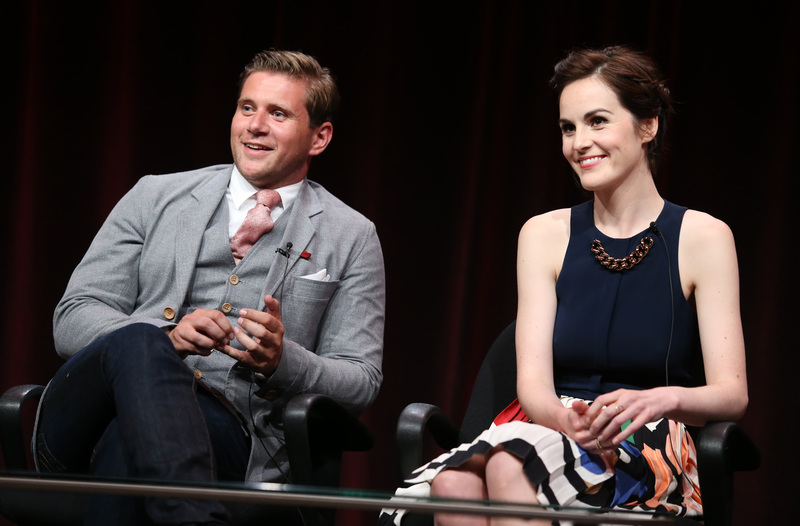 While you may not be able to steal Lady Mary or Dockery's innate sense of sophistication, you can steal her look from a recent press event with fellow cast members of Downton Abbey. The formula is simple enough: pair one navy shell with a colorful skirt, add in an edgy chain necklace and some ladylike heels, and you may as well be Dockery's twin. As soon as you master the actress's ramrod posture, of course. Start off your ensemble with a sleeveless navy shell to show off your summer glow. J. Crew's Jackie Shell in Navy is a closet classic you can pair with other ensembles after mastering Dockery's look. Add a graphic printed skirt to your ensemble for an eye-popping look. Clover Canyon's Laser-Cut Floral-Print Skirt is a modern update on the classic floral skirt. Dockery eschewed fancy footwear in favor of elegant black pumps. Get a similarly restrained look with alice + olivia's Dina Suede Pumps. If a classic chain necklace is too simple for your taste, try Fallon's Oversized Biker Choker; the proportion and spiked closure will add edge to your ensemble.